A very enjoyable slow burn. "Murder in the Heart of It All" is set in a blue-collar Mill town and is filled with a bunch of relatable, lower middle-class characters watching their town and way of life slowly fade away. Some take away the pain with drugs and alcohol, some leave for greener pastures, some hang on through good humor and optimism. Am some, consumed by rage and anger, turn to violence.Like his earlier Space opera "Milky Way Repo", Mike writes about people and relationships he knows first hand, giving this piece an unusually realistic and low-key slow burn before it erupts into violence. 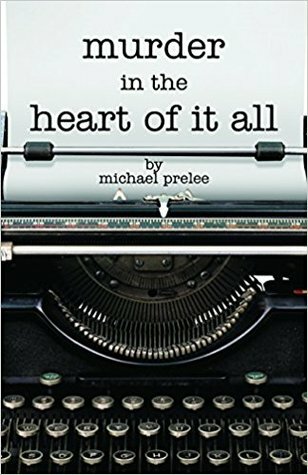 Ohio author Mike Prelee trades in the sci-fi adventure of his debut, 2014’s MILKY WAY REPO, for something more grounded with his Sophomore offering, a small-town psychodrama inspired by the real-life Circleville Letter Mystery of 1979 (http://www.the-line-up.com/circlevill...) . Someone in the small Ohio town of Hogan is sending residents nasty, anonymous letters, and things appear to be escalating. Up-and-coming reporter Tim Abernathy vows to find out who is behind the letters, and is eventually joined by his new girlfriend Amy Sashman when the disappearance of someone close to her seems to be linked to the mystery. The novel starts off slowly, letting the reader settle in to the mundane, everyday rhythms of a small Ohio town where nothing much ever happens and nothing ever changes. Gradually Prelee introduces a darker underbelly, such as the effects of a stagnant economy upon its citizens, made manifest in drug use and dark, simmering resentments. When those resentments bubble up, murder ensues, and it’s made all the more effective and grim for being played out in this drab, dull, Northeastern Ohio setting; you can practically feel the heat of the blood melting the snow. Fans of Fargo should enjoy this, a fun second novel from an already diverse author that avoids the dreaded Sophomore Slump. Better then I thoughtThis started out slow but that's how the story built up. I actually really liked this book. The author did a very good job of unfolding the story and the ending was believable. I like reading these types of stories and I look forward to more from this author. This story was great! It had interesting characters and is set in a Midwest town that has many secrets. Can't wait to see what else Prelee comes up with! Michael Prelee - Michael Prelee is a graduate of Youngstown State University. He resides in Northeast Ohio with his family where he enjoys writing. His new novel, "Bad Rock Beat Down", the second installment in the sci-fi crime series "Milky Way Repo", was released in July 2017 by EDGE Science Fiction and Fantasy. 2017 also saw the release of "Murder in the Heart of it All", a gripping mystery set in Ohio, available now from North Star Press.